Download the Recycling Guide today! Glass: Bottles and jars of any color (Please note: for the safety of our collection staff, please place any broken glass in a paper bag before placing in your roll cart or blue bag). No window glass, light bulbs, ceramics, mirrors, Pyrex (and other tempered glass products), or fiberglass. Plastics: Containers labeled #1 – 5, and #7. You can find the plastics number in the recycling triangle on the base of the container. No plastic grocery bags (regardless of number in recycle symbol), plastic wrap, rubber bands, styrofoam or packing “peanuts”, chemical containers, toys, or plastic utensils. Metals: Steel, tin, and aluminum (labels do not need to be removed). Empty aerosol (non-hazardous) cans are okay too. No aluminum foil, pie plates, toys, electronics, or appliances. Paper products & Cardboard: Newspapers and inserts, envelopes, magazines, catalogs, paperback and hardback books, phone books, food and detergent boxes, paper egg cartons, 12-pack drink cartons, folded corrugated boxes, cardboard boxes, and cereal boxes. No waxed cardboard, plastic or foil-lined cereal or cracker boxes, pizza delivery boxes, or food contaminated boxes. All of these items may be placed in a recycling roll cart or taken to a recycling drop off center. 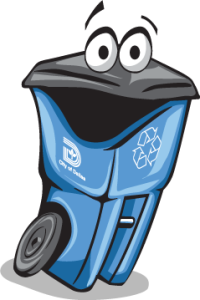 A recycling roll cart can be ordered free of charge, by calling 3-1-1 or clicking here and selecting the Service Type: Recycling Roll Cart New. For more information about recycling and household waste, visit the City of Dallas Sanitation website, or call the Recycling hotline at 214-670-4475.